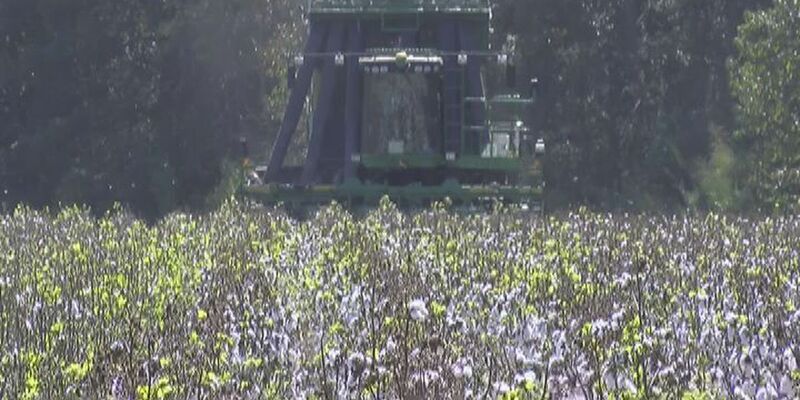 BROOKS CO., GA (WALB) - As a combine moved through the cotton field in Brooks County picking cotton Tuesday afternoon, there was less of it to pick this year than in years past. "We're experiencing a lower yield year. We've had bad weather conditions all the way through. We started out wet at plantin' time and never got a real good stem to plant, never got to growin' well early," explained, Van Murphy, General manager of BCT Gin. The drought only made things worse and the rain over the past couple of weeks made things worse still, as it delayed farmers from getting their fields ready for harvest. "Normally when you see a field of cotton, you just see solid white. But, you can see all the regrowth in it. Didn't have a good defoliation. Normally, defoliation would take all that off," said Murphy. But weather is not the only thing making this a tough year for cotton farmers. "Price has been runnin' in, normally, up in the 80s to 90 cents. This year, it's at 60 cents a pound range. So, farmers are experiencin' a very tough year," Murphy pointed out. Despite the delay in harvest, BCT Gin is nearing completion of an additional gin at its Brooks County location, which they hope will still allow them to achieve their goal of having all their cotton ginned by January 1st.